Manuela Sáenz (Dec. 27, 1797–Nov. 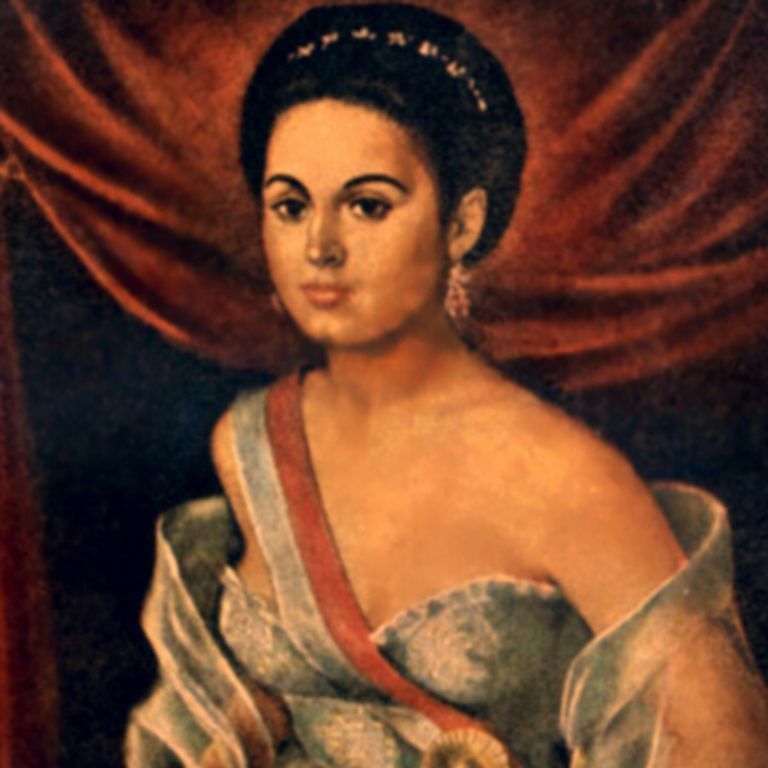 23, 1856) was an Ecuadorian noblewoman who was the confidante and lover of Simón Bolívar before and during the South American wars of Independence from Spain. In September 1828, she saved Bolivar's life when political rivals tried to assassinate him in Bogotá: this earned her the title "the Liberator of the Liberator." She is considered a national hero in her native city of Quito, Ecuador. Known For: Latin American revolutionary and mistress of Simon Bolivar. Born: Dec. 27, 1797, Quito, New Granada [Ecuador]. Parents: Simón Sáenz Vergara and María Joaquina Aizpurru. Died: Nov. 23, 1856, Paita, Peru. Education: La Concepcion Convent in Quito. Spouse: James Thorne (m. July 27, 1817, d. 1847). Manuela was born on December 27, 1797, the illegitimate child of Simón Sáenz Vergara, a Spanish military officer, and Ecuadorian María Joaquina Aizpurru. Scandalized, her mother’s family threw her out, and Manuela was raised and schooled by nuns at the La Concepcion Convent convent in Quito, a place where she would receive an proper upper class uprbringing. Young Manuela caused a scandal of her own when she was forced to leave the convent at the age of seventeen when it was discovered that she had been sneaking out to have an affair with a Spanish army officer. She moved in with her father. In 1814, Manuela's father arranged for her to marry James Thorne, an English doctor who was a good deal older than she was. In 1819 they moved to Lima, then the capital of the Viceroyalty of Peru. Thorne was wealthy, and they lived in a grand home where Manuela hosted parties for Lima’s upper class. In Lima, Manuela met high ranking military officers and was well informed about the different revolutions taking place in Latin America against Spanish rule. She sympathized with the rebels and joined the conspiracy to liberate Lima and Peru. In 1822, she left Thorne and returned to Quito. It was there that she met Simón Bolívar. Although Simón was about 15 years older than she, there was an instant mutual attraction. They fell in love. Manuela and Simón did not get to see one another as much as they would have liked, as he allowed her to come on many, but not all, of his campaigns. Nevertheless, they exchanged letters and saw each other when they could. It wasn’t until 1825-1826 that they actually lived together for a time, and even then he was called back to the fight. On May 24, 1822, Spanish and rebel forces clashed on the slopes of Pichincha volcano, within sight of Quito. Manuela actively participated in the battle, as a combatant and supplying food, medicine and other aid to the rebels. The rebels won the battle, and Manuela was awarded the rank of lieutenant. On August 6, 1824, she was with Bolívar at the Battle of Junín, where she served in the cavalry and was promoted to captain. Later, she would also aid the rebel army at the Battle of Ayacucho: this time, she was promoted to Colonel on the suggestion of General Sucre himself, Bolívar's second-in-command. On September 25, 1828, Simón and Manuela were in Bogotá, in the San Carlos Palace. Bolívar's enemies, who did not want to see him retain political power now that the armed struggle for independence was winding down, sent assassins to murder him in the night. Manuela, thinking quickly, threw herself between the killers and Simón, which allowed him to escape through the window. Simón himself gave her the nickname that would follow her for the rest of her life: "the liberator of the liberator." Bolívar died of tuberculosis in 1830. His enemies came to power in Colombia and Ecuador, and Manuela was not welcome in these countries. She lived in Jamaica for a while before finally settling in the small town of Paita on the Peruvian coast. She made a living writing and translating letters for sailors on whaling ships and by selling tobacco and candy. She had several dogs, which she named after her and Simón’s political enemies. She died on Nov. 23, 1856 when a diphtheria epidemic swept through the area. Unfortunately, all of her possessions were burned, including all of the letters she had kept from Simón. The tragic, romantic figure of Manuela Sáenz has inspired artists and writers since before her death. She has been the subject of numerous books and a movie, and in 2006 the first-ever Ecuadorian produced and written opera, "Manuela and Bolívar," opened in Quito to packed houses. Manuela’s impact on the independence movement is greatly underestimated today, as she is remembered mostly as Bolivar's lover. In fact, she actively participated in planning and funding a good deal of rebel activity. She fought at Pichincha, Junín, and Ayacucho and was recognized by Sucre himself as an important part of his victories. She often dressed in the uniform of a cavalry officer, complete with a saber. An excellent rider, her promotions were not merely for show. Finally, her effect on Bolívar himself should not be underestimated: many of his greatest moments came in the eight years they were together. One place where she has not been forgotten is her native Quito. In 2007, on the occasion of the 185th anniversary of the Battle of Pichincha, Ecuadorian president Rafael Correa officially promoted her to “Generala de Honor de la República de Ecuador,” or “Honorary General of the Republic of Ecuador.” In Quito, many places such as schools, streets, and businesses bear her name and her history is required reading for schoolchildren. There is also a museum dedicated to her memory in old colonial Quito. José Vilalta, María "Historia De Las Mujeres Y Memoria Histórica: Manuela Sáenz Interpela a Simón Bolívar (1822–1830)." Revista Europea de Estudios Latinoamericanos y del Caribe / European Review of Latin American and Caribbean Studies 93 (2012): 61–78. Print. McKenna, Amy. "Manuela Sáenz, Latin American Revolutionary." Encyclopedia Britannica, 2016. Murray, Pamela S. "'Loca' or 'Libertadora'? : Manuela Sáenz in the Eyes of History and Historians, 1900–C.1990." Journal of Latin American Studies 33.2 (2001): 291–310. Print. ---. "Of Love and Politics: Reassessing Manuela Sáenz and Simón Bolívar, 1822–1830." History Compass 5.1 (2007): 227–50. Print. ---. "For Glory and Bolivar: The Remarkable Life of Manuela Sáenz." Austin: University of Texas Press, 2008. Von Hagen, Victor W. "The Four Seasons of Manuela: A Biography." New York: Duell, Sloan and Pearce, 1952.